February 1st sees the end of RetroChallenge RC2016/1. My entry for this month was to create a calculator for the Commodore/MOS KIM-1, by way of 6502 and the KIM-Uno emulation project. I wanted to have a working somewhat-calculator running on the system, but more importantly, I wanted to learn 6502 assembler. Starting today, I'm going to attempt to better learn 6502 asm in my copious amounts of free time for the RC2016/01 Retrocmputing Competition. To prepare for this, over the past year I've gotten into working with Oscar Vermeulen's awesome KIM Uno kit, as well as pushing out my own updated firmware for it in the form of my Kim Uno Remix project on github. For the challenge, I want to use this system to make a simple integer programmer's calculator which I can run on the KIM Uno itself. 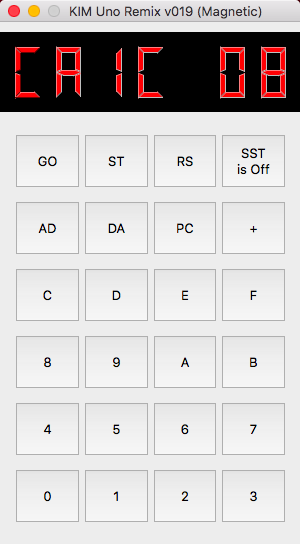 Press keys to shift in the nibbles, then switch it into a mode where i can affect the data. Convert hex to decimal, do bitshifts, add, multiply, etc. I think that one thing that held me back was getting my head around doing multibyte math with only a carry bit. For some reason I got it into my head that this wasn't enough, which of course it is. Another thing that kept me from getting everything done was that I spent a lot of time to understand the BCD/Hex algorithms. The code that I used was ultimately very similar to sample code online, but I decided that I really wanted to understand how it worked, so I didn't put it in until that was true. And of course, just the general lack of time because of various other things including: my daytime job, playing with my kid, two contracts to work on at home, being sick, etc. Over the course of the month, I learned a lot about how to work with such a limited set of registers. I came from Z80 world where you have a bunch of 16 bit registers. 6502 has one 8 bit accumulator (A), two 8 bit indexing registers (X,Y) which each can only be used for certain operations. Most everything, seemingly, is done by interacting with memory locations, specifically those in the "zero page". The 6502 has this idea where the 16 byte address's top byte is the "page" of memory. the memory in the zero page would be bytes from $0000 through $00FF. This is generally used for OS and general use variables, etc since there are small opcodes specifically for working with them. I will soon have a walkthrough of using LlamaCalc using a KIM-Uno device.